Play Waves Completed and Open to the Public! It was a long-time coming, but two splashy, fun play waves created by Pitkin County Healthy Rivers using a RICD (Recreational In-channel Diversion) were officially dedicated and opened to the public on June 30, 2018. A raft carrying the 5-member Pitkin County Board of Commissioners was the first "official" craft to bust through the new features. Thankfully, they didn't flip! Response to the project has been overwhelmingly positive. The waves "behaved" differently depending on flow levels and we received plenty of feedback from river runners and play boaters about challenges they may have faced running and surfing the waves at peak runoff. Pitkin County performed maintenance on the Healthy Rivers Whitewater Park in February and early March. The primary purpose of the maintenance was to make improvements to downriver boat passage at runoff-level flows rates. The left wing of each wave feature was modified to create a route at flows above 2,000 cubic feet per second (cfs) that bypasses the main hydraulic formed by each feature. Modifications consist of rearranging and adding boulder to the left wing of each feature using an excavator. Please keep in mind downriver boats will still have to pass through the rapid and boaters should still scout the features ahead of time and have the proper experience, skill level and safety equipment to navigate through the project reach. Thanks Diggin It River Works Inc. and RiverRestoration.org! Where is the Healthy Rivers RICD project site? For many citizens of Basalt, Pitkin County, and beyond, the Roaring Fork is our home river. The river's seasonal flows, special places and diversity of uses help define the character of our valley and our way of life. With the population of Colorado set to double in the next 35 years, western slope water is facing increasing demands on a diminishing resource. On average, 47,000 acre feet of the upper Roaring Fork annual flow is diverted through to the Front Range. Conditional water rights could allow for a substantial additional diversion from the river. The ecological integrity and recreational viability of the Roaring Fork depend upon the sustained seasonal flows of water through the river’s course. Several stream reaches on the Upper Roaring Fork are already depleted in late summer. These de-watered zones regularly occur below the Twin Lakes diversion at Lost Man, through the City of Aspen, and below Wingo Junction and into Basalt. Much of the Roaring Fork’s low and moderate flows are long since spoken for and wrangled over. Future water diversion projects are likely to target un-allocated river flows. These seasonal flows are critical to the Roaring Fork’s ecology and recreation, and they are at risk. In consideration of increasing demand on our water resources, and the potential impacts of climate change, Pitkin County Healthy Rivers has advanced a community plan to implement a Recreational In-Channel Diversion (RICD). The RICD confers to Pitkin County the right to call water down the Roaring Fork to the project site, located just upstream from the Roaring Fork's confluence with the Fryingpan River. RICD's take the physical form of a series of man-made recreational river waves. However, this Pitkin County Healthy Rivers project represents much more than a kayak play park. It secures a future that keeps seasonal flows in the Roaring Fork, maintains healthy river ecology, adds to our diverse recreational resources, and creates an opportunity for citizens of Basalt, Pitkin County, and the entire Roaring Fork community to discuss and plan new ways to enjoy our beloved river. It's our river. Let's make it right. ﻿﻿What is the Pitkin County RICD? The Pitkin County Recreational In-Channel Diversion (RICD) is a water right that allows the county to call water down the Roaring Fork River to the Healthy Rivers project site in Basalt, CO. Click here for the full decree. ​In order to call water, the county must first install in-stream structures (wave features) that will put the water to beneficial recreational use. Those structures are slated for construction in late 2016. Click the tabs below to find out more about the benefits of this RICD. This project gives Pitkin County the legal standing to shepherd seasonal water from the Roaring Fork headwaters downstream to the RICD location in Basalt where it is momentarily put to recreational (non-consumptive) use. The entire reach of the Upper Roaring Fork River channel will benefit from the preservation of these flows. The Independence Pass Trans Mountain diversion system currently diverts 37% of the upper Roaring Fork River. Conditional water rights could allow an additional 30% increase in these diversions (refer to Draft Colorado Basin Implementation Plan Schmeuser, Gordon Meyer LLC Carbondale, Co. May, 2014). Future water diversions and increased storage capacity will likely target un-allocated peak river flows. The Pitkin County RICD will gain permanent rights to protect a portion of the summer flows so that they remain in the river channel for ecological and recreational benefit. This Pitkin County RICD water right is junior to all existing rights but will precede all future claims. There are a number of identified stream reaches on the Roaring Fork where low flows during the summer and fall result in severe stress to aquatic organisms including trout. Maintaining seasonally high flows in the Roaring Fork is very important to fish health and the overall ecology of the river. The Pitkin County RICD helps ensure that future diversion projects will not be able to detrimentally commandeer the Roaring Fork’s early season flows or deplete late season flows. Higher flows maintain cooler temperatures in the river water for cold-water species such as trout. Cold water is vital to maintain high levels of dissolved oxygen for trout and aquatic invertebrates. Higher river flows dilute pollutants such as storm water run-off, wastewater (ammonia and coliform bacteria), and acidified mine drainage. Higher flows provide improved and larger areas of in stream habitat for fish and aquatic insects. High spring run-off events provide flushing flows that remove fine sediment and debris in river gravels to improve trout spawning beds and insect habitat. The physical habitat of this stream reach is already highly impacted by humans. This project offers an opportunity to restore this river reach to a healthy condition. Possibilities exist for enhancing terrestrial habitat along both banks of the river. 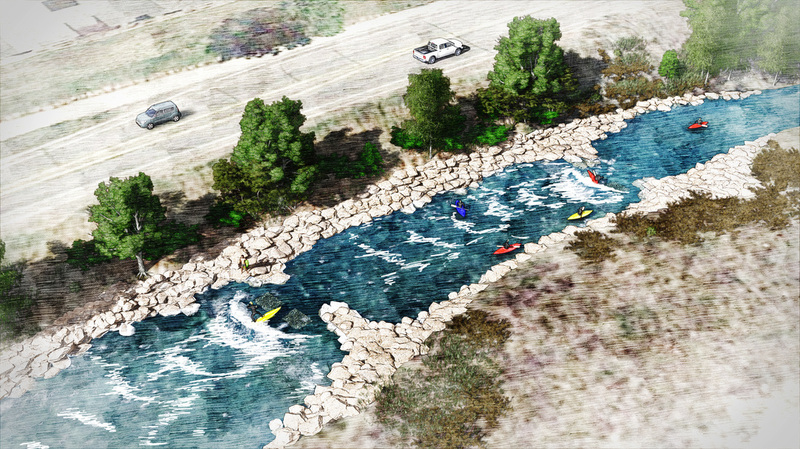 To meet the requirements of the RICD water right, Pitkin County is constructing two play-wave features with adjacent eddies that will be a local amenity to the whitewater boating community during periods of seasonal peak flows. The upper wave will be designed as a "hole" feature for kayak surfing. The lower wave will be a "green" feature and has been designed with stand-up paddle-boarders in mind. These combined features will form a fun and convenient mid-valley surf spot. They will also create a great place for teaching/learning whitewater skills. Water that is seasonally called to this feature will also enhance recreational boating flows in the upper stream reaches of the Roaring Fork (Northstar, Slaughterhouse, and Toothache). During the "non-boating" months (typically September through May) the features will primarily provide fishing access with enhanced habitat due to the enlargement and deepening of the pools below the features. The recreational feature and river access will provide opportunities for multiple river user groups including boaters, fishermen, and the general public. Overview of the in-stream design completed as a requirement for gaining the Pitkin County RICD water right. RICD’s have a proven track record as powerful catalysts for much larger community improvement efforts. Vail, Golden, Buena Vista, and Salida for a few examples of Colorado communities that have used RICD’s as anchors for expanded recreation projects that have strengthened ties between community and river. This Pitkin County Healthy Rivers project has initiated an opportunity for citizens of Basalt, Pitkin County, and the entire Roaring Fork community to discuss and plan new ways to enjoy our beloved river. Basalt has a reputation as a “river town.” This project builds on that concept and may help the town embrace the river. The features are located within walking distance from the Basalt town center and schools. This has potential to stimulate a closer relationship between Basalt residents, visitors and the river. The features could potentially host future river events (an economic benefit to Basalt and local businesses). In 1995, Two Rivers Road washed out and destabilized the river-bank immediately river-right of the planned in-stream features. The community could benefit from structural, aesthetic, and public safety improvements to this stream-bank. Interpretive and educational opportunities may be developed in areas immediately adjacent to the in-stream project. This project may be leveraged as a model for promoting and fostering river stewardship.